We’d love your help. 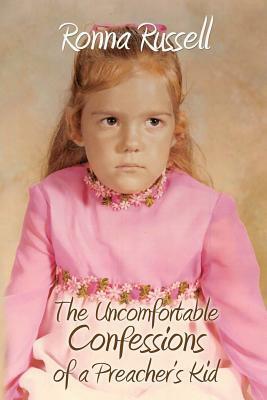 Let us know what’s wrong with this preview of The Uncomfortable Confessions Of a Preacher's Kid by Ronna Russell. To ask other readers questions about The Uncomfortable Confessions Of a Preacher's Kid, please sign up. Ronna Russell’s memoir of growing up in an oppressive religious family and finding her own path to freedom and happiness is riveting. Her story belongs in the “you just can’t make this stuff up” category of fascinating truth. Most of all, it’s a story that needs to be told about the troubling quiet realm of spiritual abuse. I first became aware of Ronna Russell through her blog. It was immediately obvious that she had already found her “voice” as a writer, but it’s been a pleasure to see her develop her craft and to see a dream realized in the publication of this, her first book. Having grown up in the same religious environment and the same era, I found the book to be painful, funny, cathartic, and horrifying, sometimes all at once. Ultimately, though, Ronna’s triumphant emergence as a whole person committed to tr I first became aware of Ronna Russell through her blog. It was immediately obvious that she had already found her “voice” as a writer, but it’s been a pleasure to see her develop her craft and to see a dream realized in the publication of this, her first book. You can’t put this book down once you start, so escape to your quiet place for half the day. Bring a cozy blanket, beverage of choice and tissues!